The UN Summit for Refugees and Migrants holds the promise of progress. But ahead of the summit, communications staff were pushing a warped view of migrant diversity. Even the International Organization of Migration (IOM) is straying from its mission to uphold the human dignity and well-being of migrants. When migration issues rose to the top of international agendas last year the word ‘migrants’ became a matter of contention. Many interventions were cast as a matter of clarification and correctness, but actually concealed a fundamental disagreement: do ‘migrants’ include ‘refugees’? There are two opposing views, which can be called inclusivist and residualist. The first holds that migrants are people who have changed their country of usual residence, irrespective of reason. In short, migrants include refugees. This is how the IOM and several other define it, along with many academics. In my opinion, the inclusivist approach is essential to the vision of migration management for the benefit of all. Conversely, the residualist view sees migrants as people who have moved to another country for any reason other than to seek international protection as refugees. This view is promoted by the United Nations High Commission for Refugees (UNHCR), which has continuously argued that ‘refugees are not migrants’. The UNHCR even implies that other views are either ignorant or irresponsible – that they don’t realise that ‘word choice matters’ or that they fail to take the vulnerability and rights of refugees seriously. There is nothing contradictory in using the term ‘migrants’ inclusively and ensuring the welfare of migrants who need protection as refugees. On the contrary, an inclusive definition of migrants means recognising that anyone on the move may have a well-founded fear of persecution and be entitled to international protection. The circumstances of refugees are specific ones – but so are those of victims of trafficking and undocumented migrants, for instance. The UNHCR is making the perils of the ‘migrant’ label a self-fulfilling prophecy. The organisation argues that being labelled ‘migrants’ can have ‘serious consequences for the lives and safety of refugees’. But at the same time, the UNHCR’s Communications and Public Information Service promotes an understanding of ‘migrant’ that has this life-threatening effect. Many journalists feel insecure about the terminology because of the perceived moral and political fallout. Some find the phrase ‘refugees and migrants’ reassuring because using both terms is a way to play it safe. Others uncritically consult the UNHCR as the perceived authority on the matter, and so end up with the phrase ‘refugees and migrants’. But the more we use ‘refugees and migrants’, the more we reinforce the view that ‘migrant’ is a residual and not an inclusive term. The UNHCR recommends the phrase ‘refugees and migrants’ to describe migration movements that may include people in need of protection as refugees. But where do we draw the line? Perhaps we can say ‘migrants’ about the tens of thousands of Indians who move to Europe every year, many of them for high-skilled jobs? If we follow the UNHCR line, we have to say ‘migrants and refugees’ because roughly 0.1 per cent of Indians who come to Europe are, in fact, recognised as refugees under the Geneva Convention. With a residualist position, it is virtually never safe to only use ‘migrants’. The UN’s initiative to ‘Address Large Movements of Refugees and Migrants’ takes a curiously ambiguous approach to terminology. The website’s definition page uses the UN Department of Economic and Social Affairs’ (UNDESA) inclusive description of migrants as people who have moved to another country ‘irrespective of the reason for migration’ alongside an explanation of ‘refugees’ from the UNHCR. So the definitions side-by-side imply that migrants include refugees. But everything else suggests the opposite view. The very name of the initiative and summit centres on ‘refugees and migrants’, as if they were mutually exclusive categories. The residualists appear to have lost the battle of the definitions page – but won the war of the initiative as a whole. As the residualists have prevailed, the IOM could have offered resistance. A key point in the IOM’s mission is to ‘uphold the human dignity and well-being of migrants’. But unfortunately, the IOM’s response has apparently been feeble: instead of challenging the redefinition of ‘migrants’ the IOM expresses allegiance by preferring ‘migrants and refugees’ to UNHCR’s ‘refugees and migrants’. Respecting IOM’s own definition of migrants would have shown that this phrase is as meaningless as ‘fish and salmon’ or ‘maples and trees’. ‘Refugees and other migrants’ would have been more meaningful, of course. Amid the widespread denigration of migrants, the IOM’s #iamamigrant campaign has been a blessing. Using a special hashtag and website, people can share their stories and express pride in being migrants; they can even download a customised ‘I am a migrant’ poster. Now more than ever, #iamamigrant could have promoted an inclusivist definition of migrants – celebrating a diversity of individuals while noting a variety of vulnerabilities. Instead, the IOM’s Media and Communications Division has begun promoting a residualist view, clashing with the organisation’s traditional stance. The #iamamigrant campaign is no longer focused on genuine migrant diversity but coupled with a parallel #iamarefugee campaign. The ‘separate but equal’ approach is complete with matching colour-coded icons and banners for the two labels. 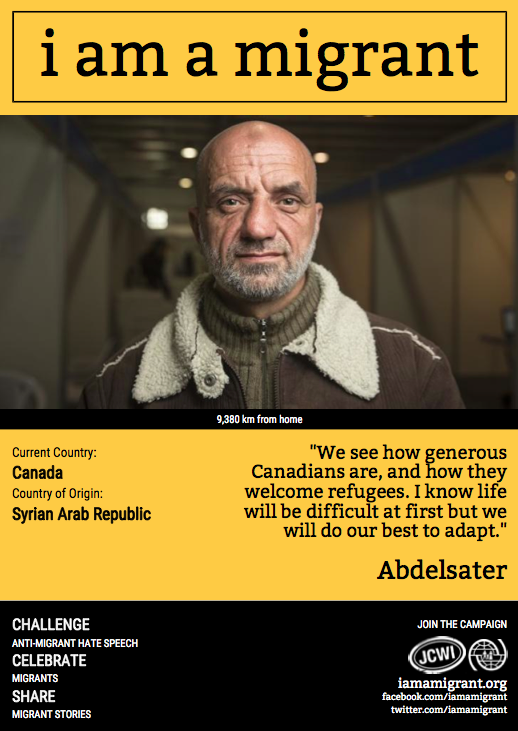 Several refugees were featured in the original #iamamigrant campaign. Abdelsater, Abraham, Annet, Charles Dekha, Suman, and others could be found on the campaign’s website as late as this summer, representing migrants who had escaped from danger. But their #iamamigrant identities have been deleted. Instead they have resurfaced on iamarefugee.org. One of the affected migrants confirmed that the IOM had not been in touch about the relabelling, and the IOM did not respond to a request for comment. I wish I knew what was happening inside the IOM. Is the Media and Communications Division detached from strategic leadership? Or does their strategic leadership involve sacrificing the notion of ‘migrants’ that so clearly underpins the organisation’s mission? This post was originally published on the web site of UNU-MERIT United University in Maastricht, where I am a Visiting Professorial Fellow. Thanks to Howard Hudson for editorial support.